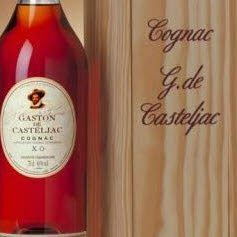 Cognac brandy XO Gaston de Casteljac A sweet, elegant palate, balanced and still firm with sweet lingering flavours. Big, rich, aged fruit nose of firm oak and vanilla with some soft fruit still in the background. A sweet, elegant palate, balanced and still firm with sweet lingering flavours. The package is also suitable for postage and we will add an Birthday gift card, Anniversary card and many more. Casteljac Cognac are from a craft production which wants to stick to the expression of the gustative quality: to appreciate one of these cognacs is above all a rare privilege. The Cognac G. de Casteljac is made from pure and natural white wines, carefully selected, which will reveal these typical aromas and will give them the same characteristics as the original and traditional cognacs of the 18th century. In order to preserve an intense aromatic range, they are distilled very slowly, without filtration.